With the time required to finalize an international adoption expanding in several countries, the United States Citizenship and Immigration Services (CIS) is now offering parents an opportunity to save on immigration fees if their adoption process takes longer than 18 months. "If you already have an approved I-600A that is about to expire, and have not yet filed your I-600 petition, you may receive one free extension,” the USCIS notes as long as the parent resubmits before their first I-600A expires. Every potential adoptive parent must have a valid I-600A to complete the adoption in their child’s country. Since the I-600A is valid for only 18 months, many adoptive parents have had to reapply and pay CIS fees all over again. Although this new procedure accompanies an increase in the initial I-600A fees, the free extension should help to limit international adoption costs for many families. The new fees for the I-600A Advanced Processing for Orphan Petition is now $750 for parents and $80 for each person 18 or older living in the home. Please call your local USCIS office with any questions to properly comply with the new implementation of this ruling. I hope you already know this but if not, Please let Children's Hope know if you have any problems, issues, concerns, complaints, etc. or just need support. Please do not wait until your adoption is finalized to tell us. International adoption is difficult enough without us adding to the stress. Children's Hope is here to help you during your adoption journey. As you know, things may change in the process and we need to adapt to those changes and our families' needs. Your Children's Hope social worker or adoption consultant, branch director, China team in St. Louis and myself are here to serve you. Please do not be shy about calling or emailing us if we are not meeting your needs. For those considering adopting transracially through Children's Hope Ethiopia Program, two videos are available online for your review: A Girl Like Me and Struggle for Identity (the first for free full view, the second for purchase). Sharon Turner Ethiopia Program Director shares A Girl Like Me, a seven minute award winning film on the issues of racism and stereotypes in the African American community. Although those interviewed are not necessarily adopted or of Ethiopian heritage, they do share a powerful statement on the perceptions of African-American youth in American culture today. For my high-school literature class I was constructing an anthology with a wide range of different stories I believed reflected the black girl’s experience. ...When I was accepted into the Reel Works Teen Filmmaking program, I set out to explore the issues [of the standards of beauty imposed on today’s black girls and how this affects their self-image]. I also decided to reconduct the “doll test”, initially conducted by Dr. Kenneth Clark and used in the historic desegregation case, Brown vs. Board of Education. I thought by including this experiment in my film, I would shed new light on how society affects black children today and how little has actually changed. This documentary may be viewed in its entirety online, at Media That Matters Film Festival. The short film may be incorporated into some regions’ parent education workshops for Ethiopia. An alternate video, Struggle for Identity, designed to inform adoptive parents about the needs of children of a different race or culture, is available for purchase online. By tomorrow or Friday, the first Children's Hope family dossier will arrive in Ethiopia! A second dossier will make its arrival Friday or Monday, after certification and authentication in Washington D.C. Several families' dossiers are ready to be submitted as soon as they receive CIS approval. Congratulations to these families as they move forward in their Ethiopia adoptions as Children's Hope first Ethiopia families! The White Swan Hotel, the current hotel of choice for China adoptive families, will be undergoing an extensive renovation beginning October 2007 through December 2008. The hotel will be closed for business during this time. As a result, Children’s Hope has been investigating the best possible hotel alternative for our adoptive families during their stay in Guangzhou. From the many suitable hotels in the area, Children’s Hope chose the Westin Guangzhou which will provide for our families’ unique needs during the finalization of their adoption, for a reasonable price. This five-star hotel, near the U.S. consulate, is brand new and set to open May 2007. Our travel department in China has negotiated the new contract for our families, which includes the top amenities and features requested by our adoptive parents. We understand our families’ disappointment in the loss of the White Swan, which has been a tradition for adoptive families since the beginning of Chinese adoptions. It is our hope, however to create a new tradition at the Westin. One tradition that will remain the same: ‘Going Home’ Barbie. She will be traveling to the Westin, along with other gift options: baby bathrobe or Westin Pillow with Gotcha date. Additional parent advantages are the provided Westin Heavenly Crib, diapers for the first day, Heavenly Baby Bath including plastic tub, baby shampoo, baby oil and toys, and baby strollers for rent. Four bottles of water are provided daily to each family during their stay, and the hotel water is potable as well. The Westin also offers 22 executive suites comprised of 2 bedrooms, 2 ½ bathrooms and a living space. The Westin Hotel Guangzhou is located at 6 Lin He Zhong Road in the Tian He District in Guangzhou, Guangdong 510610 China. Become acquainted with the Westin by viewing their web site at www.westin.com/guangzhou. Children’s Hope will provide a tour to Shaiman Island for our families to shop and visit this special and wonderful area. Children’s Hope is proud to announce our partnership with the Schnucks grocery chain. When you feed your family, you will help feed orphans worldwide. If you live in Missouri, Illinois, Wisconsin, Tennessee, Mississippi or Iowa, and shop at your local Schnucks market with your eScrip Community Card, Children’s Hope International will earn funds to support nutritious meals and other assistance for orphans and impoverished families internationally. 1. Pick up your card at any Schnucks location (Customer Service area). 2. 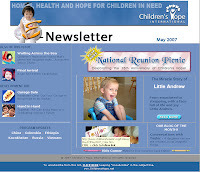 Activate your card(s) by calling 1-800-931-6258 or visit www.escrip.com/schnucks.jsp; designate Children’s Hope International as the recipient. 3. Present your card to the cashier every time you shop at Schnucks. You can pay for your groceries any way you choose. Simply swiping your card generates contributions from Schnucks to Children's Hope International. 4. The more you shop, the higher the contribution to Children’s Hope. For every dollar you spend, Schnucks will contribute up to 5% of your purchase amount. Follow one of the links below for additional information about the eScrip program in your state. As reported by The Argus Leader on May 10, ninety-six China adoptive families were set to return to the United States after completing their China adoptions on April 14 and 15. A State Department technical difficulty with the computer used to issue visas to adopted children caused a several-day backup. Due to the Guangzhou Trade Fair in progress, hotel stays were difficult to extend and many families feared they would have no overnight accommodations. A call from Senator John Thune of South Dakota helped speed families' return home. are able to get their child's visa processed the next day. At Children's Hope, we ask families not to book flights or schedule their leave from Guangzhou on the same night they are to receive their child's visa, in case of a delay," says Karolyn Tucker, Children's Hope China Travel Coordinator. No Children's Hope families were involved in the April delay in China. Every month we email our families and those inquiring about international adoption our monthly e-news publication. This month is special as it is our Mother's Day Edition and we are very excited for our mothers-to-be and new mothers through adoption. Congratulations! Your love is appreciated even if it is sent from afar. Each month our waiting and completed families share photos, stories, and a piece of themselves with our Children's Hope Family, in the hope that it will inspire those in the wait and join us together in the celebration of adoption. In this edition, we have featured a true miracle comeback story, our Blog of the Month, a special Mother's Day poem from a mother to her daughter Across the Seas, and much more. Be sure to check out Kids Corner for Mother's Day coloring pages to download and print. Choose a favorite, gather up your coloring tools, and make Mom a card to show how much you love her this holiday! Click here to view the May E-News and everything it has to offer. We hope you enjoy this special issue. Happy Mother’s Day to you all, whether your child is home in the States...or waiting for you abroad. Colombian Book Review: "Gaviotas: A Village to Reinvent the World"
Alan Weisman’s book, Gaviotas: A Village To Reinvent the World, is a firsthand account of a true Colombian treasure. Gaviotas is a village in eastern Colombia that originated in 1971 when a group of Colombian visionaries set out to design a self-sustaining community that was both environmentally sound and promoted peace and prosperity in a place that was affected by war and conflict. The simple concept behind Gaviotas was to determine if people could thrive in one of the most environmentally challenging, barren savannas on earth, and promote peace for all Colombians during a time of political and governmental turbulence. The visionaries, Paolo Lugari and Jorge Zapp, set out to determine if "utopia" could occur at Gaviotas. If this were attainable, it would be possible to cultivate a sustainable environment anywhere in the world. Weisman details both the inception of Gaviotas and the brilliant Colombian visionaries that have inspired biologists, scientists, environmentalists, and activists worldwide. For more than 30 years, Gaviotans have invented sustainable living with items such as windmills that convert energy, solar collection pumps for water, and the planting of renewable crops to regenerate an ancient native rain forest. Gaviotas and its founders have been recognized by the United Nations, summits for the World Conferences, and deemed an inspiring model of Utopia for the developing world. The book details the political history of Colombia, the beautiful diversity of Colombian artists, scientists, professors, native Indians, and the common people, and the passionate cultural influences that led to the creation and success of Gaviotas. Last week Ethica, a non-profit voice for ethical child placement, released interesting news regarding agencies attempting to "umbrella" under those agencies that are licensed to facilitate Vietnam adoptions. These unlicensed agencies advertise Vietnam child placement through partnership or networking agreements. Families working with un-licensed agencies are vulnerable to being caught in delays should the Vietnamese government assert that only licensed agencies may place children. Officials may make this statement at any time and it would be effective immediately, without a formal decree. Families should take this risk into consideration and refer to the Hanoi U.S. Embassy's list of licensed agencies when choosing an adoption agency. Additionally, families should note that a similar practice was used in Russian adoptions. Families that had worked with unlicensed agencies suffered serious financial and emotional repercussions when representatives could not complete their adoptions. "Hopefully, this will cause unlicensed agencies to become more ethical and upfront with their programs," notes Nicky Losse, Vietnam Program Director. "Let me state clearly that Children's Hope does not umbrella under any agency nor do any agencies umbrella under Children's Hope." A day earlier than expected, Children's Hope received the referral packets from the China Center of Adoption Affairs. Fifteen Children's Hope families from across the nation were matched with their children in China and were able to view photos and medical reports for the first time. Their beautiful children are all girls from the Jiangxi province and range in age from 7 to 11 months. These referrals were for the 10/27/05 through 11/1/05 log in dates. The families waited 18 months from log in date to referral. We expect each family to travel in about 8 weeks to complete their Chinese adoption. It was a happy day for so many. Congratulations!